I’ve been thinking for a while about how the Israeli Defence Force used social media during the conflict in Gaza and I’m not at all convinced the campaign was successful. Yes, the IDF was right to engage with the Internet and social media. But the way they went about it was questionable. I have two major criticisms. First, they broke an age old rule of effective propaganda or information operations: trust needs to be established. This is necessary both for genuine attempts at imparting reliable information and also for operations in deception. If you are setting out to accurately try to tell the truth in an honest and open way then it’s far better to build up a reputation for doing so, before you have a major, highly contested conflict on your hands. Launching a Youtube channel, blogs and Twitter feeds just prior to an invasion of Gaza automatically arouses suspicions of the nature and purpose of these new communication outlets. Airstrikes over the Gaza Strip began on the 27 December 2008. The IDF Spokesperson blog started the day before with a list of rockets fired into Israel. The Youtube channel was launched on the 29 December 2008. And the Twitter feed looks like an afterthought, beginning on the 3rd January 2009. It would have been far better to have started these new ventures months beforehand at a time when the only obvious purpose could have been legitimately claimed as being a desire to engage in the social media space. Through accurate reporting on blogs, Youtube and Twitter, the IDF could have built up a reputation for trustworthy and credible information which could have been verified by other media outlets. When war breaks out, audiences might have been far less sceptical of the information provided on these new forms of media. As it was, the sudden appearance of these new information channels on the eve of a conflict instantly suggested a serious IDF propaganda campaign. Of course, a base of trustworthy information could also be used as a means of employing successful information deception. Although I’m not advocating this approach and am not suggesting this is what the IDF would do, it is plain that deception operations have long been used by militaries, and the militaries of democratic nations are certainly no exception. If you have a reputation for being accurate and trustworthy, when you do decide to start twisting the truth (or blatantly lying) you are far more likely to be successful in achieving the necessary deception. (Though obviously this carries significant long term risks). In addition to this failure, the IDF has simply grafted all the old ways of information campaigning into new formats, without any specific regard for the conventions of social media. 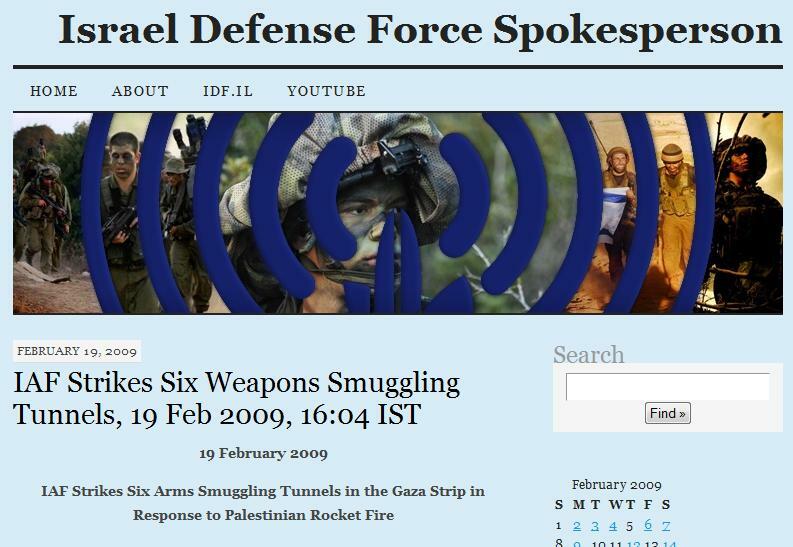 Calling a blog ‘IDF Spokesperson’ is a hark back to impersonal, corporate, official voices. Who is this IDF Spokesperson? Why should we believe him, her or them? The IDF Spokesperson sounds like a scary non-descript Orwellian voice telling us what to think. At least Mark Regev, an Israeli government spokesman, who did lots of radio and TV interviews, has a human face (and voice) with which we might empathise. This Youtube explanation of the bombing of the UN schools in Gaza also demonstrates a failure to understand social media. The statement, and it is a statement, by Capt. Benjamin Rutland takes place in a washed out ‘non-place’ with the Israeli flag propped up against the wall. Why not ‘casually’ film it ‘somewhere’. I’d suggest where Capt Rutland works, though anywhere would be better and the whole style needs to be much more informal. Much more real, open, honest and genuine. (Even if the content is not real, honest or genuine). And all approaches suffer from a lack of community engagement. Whether this is possible for military organisations is highly debatable. Can you imagine the response on the IDF Spokesperson blog if the comments were turned on!? But the point is that social media without the ‘social’ aspect is often highly uncompelling. P.S. I have emailed the IDF on several occasions for comment on this piece but they have so far failed to respond. P.P.S. Here’s an excellent look at various aspects of the social media battle waged during the recent conflict in Gaza. Author Jaron Gilinsky explores the Help Us Win campaign, and the Israeli Defence Force’s use of Youtube. He also speaks to Gazan blogger, Sameh Habeeb, who became a one-man news agency.